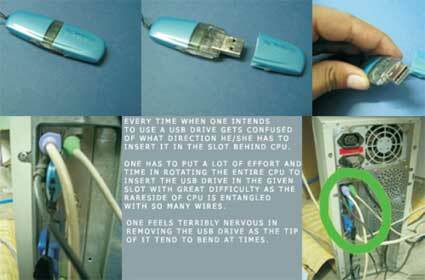 Every time one intends to use a USB drive one gets confused as to what direction he/she has ti insert in the slot behind the CPU. One has to put in lot of effort and time to rotate the entire CPU to inssert the USB drive in the given slot with a great difficult as the rear side is entangled with wires. One feels terribly nervous to remove the USB as the tip of the drive bends at times.